White paper on crime 2001 Part3/Chap.1/Sec.2/3. Fig. III-9 shows the trends in the number of juveniles referred by the police for road traffic violations and the number of crackdowns on violations of Road Traffic Law related to driving vehicles, etc. (the number of notified cases of non-penal offenses and the number of referred cases of penal offenses) since 1966. 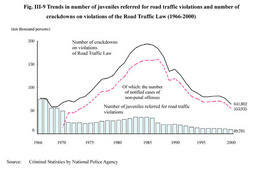 The number of juveniles referred by the police for road traffic violations has decreased substantially since 1987, when the scope of application of the traffic violation notification system was expanded. Since then, the number tended to decline and reached 89,781 persons (a drop of 14.6% from the previous year)in 2000. Meanwhile, the number of crackdowns on juvenile violations of Road Traffic Law peaked at approximately 1.94 million cases in 1985. Since then, however, the number tended to decline. The number of crackdowns in 2000 was 641,802, of which 553,935 cases (86.3%) were notified as non-penal violations. With respect to percent distributions of types of violation in penal cases by juveniles, driving without a license had the largest share (43.4%) in the total number of cases, followed by speeding (24.7%), driving while intoxicated (7.4%), and seating capacity violations (5.5%). As compared with adult cases, the percentage of those driving without a license was significantly higher (5.2%for adults) among juvenile cases.